Cute hand painted glazed ceramic shakers by Susan Winget Cretified International Corp, marked CIC. Measures 3 1/4" tall and are in perfect condition. One plastic stopper is missing. 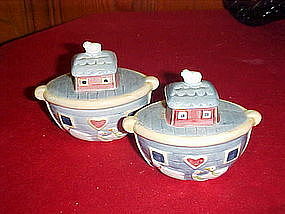 I have the matching cookie jar listed also.